Kebab is general term for a variety of meat dishes originating in Iran. So what we thought that kebabs are refered as meats on skewer or wrapped in bread with salad is a bit of a misnomer. By tradition in Iran, kebab can include a variety of grilled, roasted, and stewed dishes of different meats and can be served on a different number of ways but since the most popular one is the shish kebab or doner kebab we already associated that name to those dishes. The traditional meat used for kebab is lamb but it all depends on the local tradition of a regional location so beef, goat and chicken are the other options. The word kebab came form the word kabbaba which means “to burn”. It was invented adound the 14th century by Medieval Iranian Soldiers where they dont have proper utensils to use during times battle so they opted to use their swords to grill meat in open fires. For this dish we will be making a kebab salad, which is composed of grilled meat over salad vegetables which you can pair with naan or rice. Here in New Zealand its common for Kebab shops to use rice but is not just a normal boiled rice, they usually used greased (butter or animal fat) rice to make it more tasty, I prefer garlic rice over those. So its up to you what to pair this with and I will leave it open for your choice. Preheat oven at 190C, rest the beef rump in room temperature for an hour before cooking. Rub around 1 tbsp of olive oil, 1 tbsp salt and 1 tsp pepper on the roast. Now place it on an oven rack with the fatty side up then place quartered tomatoes and onions on the top of the roast. Now bake for 30 minutes at 190C then lower the heat to 100C and cook for 3 hours. Carve the roast into flakes then drizzle soy sauce and olive oil on top. Then set aside. If you use buttered rice or any other forms of rice, place rice on the bottom of the plate then place a layer of garlic hummus and chilli sauce. Place a layer of chopped lettuce, then chopped tomatoes, then chopped onions, slices of cucumber then chopped parsley, then carved meat. Now finish it with sour cream dressing. I love that you always give a bit of history around your recipes – it’s great to learn new things. 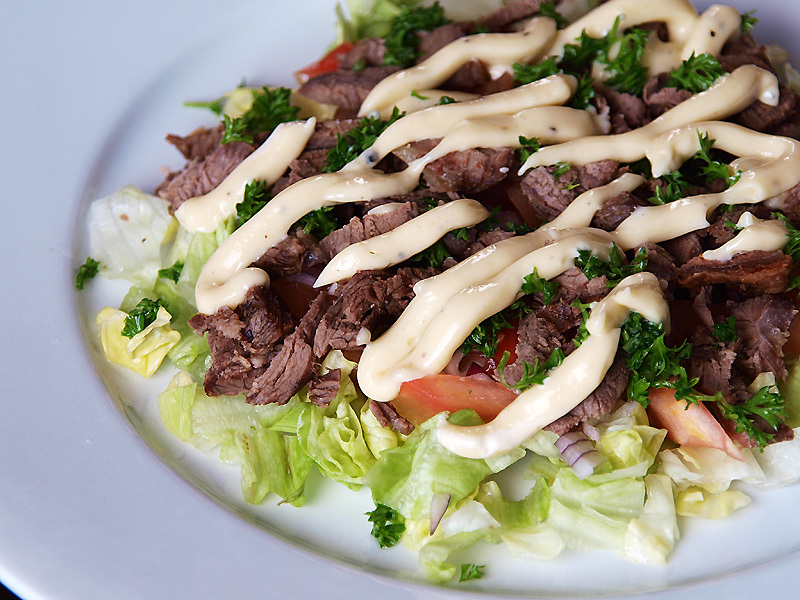 Your Beef Kebab Salad looks delicious. Yeah, I love to learn specially food history I’m always curious how dishes are invented specially Chinese ones as they do have a lot of stories behind each dish.